Welcome to Our Lady of Mercy Convent School School website. We hope it gives you an insight in to the life of our school. Our Lady of Mercy is an all-girls school with classes from Junior Infants to Sixth Class. We are a welcoming, happy school which promotes academic excellence in a safe, supportive and inclusive environment. We work hard to achieve the best possible outcomes for all pupils, so they can reach their full potential in body, mind and spirit. “To encourage, challenge and nurture our children and the wider school community as together we grow in body, mind and spirit. Tá ár dTiarna linn”. Our school community, which includes the teaching and ancillary staff and the Board of Management, work in partnership to meet the needs of our pupils. We are blessed to have a team that are unerring in their commitment and energy for their students. We strive to develop an open, positive relationship with both pupils and parents. We value and look after the needs of every child and work to ensure that all of our pupils enjoy their time here in a warm and happy atmosphere. It's hard to believe the Easter holidays are almost upon us and what a busy time we've had since Christmas. The girls have worked so hard on all areas of the curriculum and engaged in all aspects of school life with such vigour and enthusiasm. It's been a busy and eventful time all round. Comhghairdeas libh go leir. Check our website regularly for upcoming events and news.! You couldn't but be impressed with this morning's Easter Bonnet Parade for all the colour and creativity on view. There was great excitement around the school and everyone looked fantastic. All proceeds raised from the event will go towards Down Syndrome Ireland, which offers support and services to people with Down syndrome and their families throughout Ireland. Take a look at the slide show attached to witness 'all the frills of the Easter Bonnet Parade'. Special thanks to all those who bought tickets and/or donated Easter Eggs for Our Easter Raffle in aid of the 6th Class charities Light up Gold and Temple Street Children's Hospital. We really appreciated your support. Well done to the girls in 2nd Class who celebrated their Sacrament of Penance in the church last night. It was a most beautiful ceremony, thanks to all their hard work and preparation under the guidance and support of their two teachers, Ms Cervi and Ms Murray. 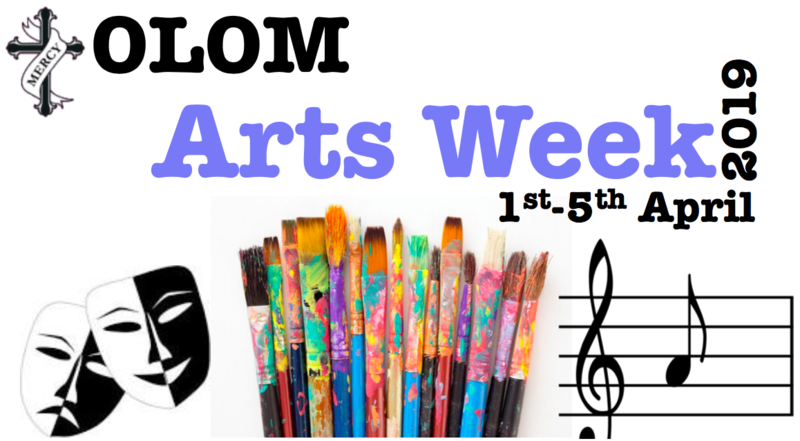 We are thrilled to share a glimpse of our Arts Week with you. We went on a cultural discovery, explored our hidden talents, revealed our inner performers and ignited a passion for the arts that will stay with us for many years to come. A huge, huge thank you to Ms Moloney, Ms Collins and the Student Council for organising such a fantastic Arts week last week. From the visits to the Galleries, the music, dance and drama workshops, tin foil sculptures, art exhibition, spectacular talent show and the Jackson Pollock School Murals, every element of the arts was covered. The girls had a terrific time and are so grateful to the enormous amount of work invested in the week by Ms Collins and Ms Moloney. Well Done to our Camogie team who finished their league yesterday displaying great skills of sportsmanship and huge progress all round. Special thanks to Ms Ní Fhaoláin for her time and commitment to the team. Our 5th class girls will return home today from Coláiste na Rinne in Co Waterford. We hope they all had wonderful and enjoyed their Gaeltacht experience. Sincere time to Ms Parkinson and Therese for all their time and support in accompanying them on the trip. A huge congratulations to the girls of 5th and 6th class and their teachers Mrs Parkinson, Ms Doherty and Ms Cumiskey for all their hard work and commitment they gave to the National Children's Choir programme this year.The concert on Wednesday night was just amazing and truly appreciated by all who were attended it. ​Well Done girls, we are so so proud of you all. We had such a successful 'Seachtain na Gaeilge' that we decided to make a music video (físeán) to go with our amhrán - 'Amhrán na gCupán'. Every class learned this song and we gathered videos from every class to make this lovely físeán. We also added all the lovely photos taken over the week. Seo físeán den amhrán sa halla. ​This is a live version of the song in the hall! What a fantastic week we had here in school for Seachtain na Gaeilge, celebrating our Irish culture and language in a very special way. Míle buíochas ( 1000 thanks) to Mrs McGovern for organising every last detail of all the activities and events and making it such an eventful and fun week for everyone. We were delighted to welcome the judges of this year's Tidy Schools in the Community Competition into our school last Friday. After visiting the two yards and soaking up the pleasures of the New Wildlife Garden, they gave us very positive feedback and praised everyone for keeping our school so clean and tidy. Our school will close for the Easter holidays on Friday the 12th of April at 11.45a.m and will re-open again on Monday the 29th of April at the normal time of 8.35a.m. We wish each and everyone of you a very happy Easter. Our Lady of Mercy Library News! All payments to Our Lady of Mercy can now be done online through our Aladdin ePayment system. Such a system facilitates secure, easier payments to the school and reduces the amount of cash and cheques being sent in to the school in line with Central Bank directives. In April 2016 the Minister for Justice and Equality commenced the National Vetting Bureau (Children and Vulnerable Persons) Acts 2012 to 2016 (the Vetting Act). It has put in place statutory requirements for the Garda vetting of persons involved in working with children or vulnerable persons, including those working in schools. In line with our own good safety practices and procedures, if you think you might like to get involved in any aspect of your child's life in school you must be vetted. We ask that you download the application form and return it with two forms of ID, one containing a photo of yourself which, Fiona in the office will photocopy in your presence, to initiate the application process. Thank You for your support and understanding on this matter but our children's safety and welfare is of of key importance to us all. We have revised our Child Safe Guarding in accordance with the Children First Act 2015, National Guidance for the Protection and Welfare of Children 2017, The Child Protection Procedures for Primary and Post Primary Schools 2017 and Túsla Guidance on the preparation of Child Safe Guarding Statements. Please click here for our Child Safeguarding Statement.